The Coast Guard, seasickness & the night I became a sailor. “Sailing Vessel Dawg Gone, Sailing Vessel Dawg Gone, this is the US Coast Guard St. Pete. Go ahead Captain.” The radio blared, still barely audible over the screaming outboard motor. 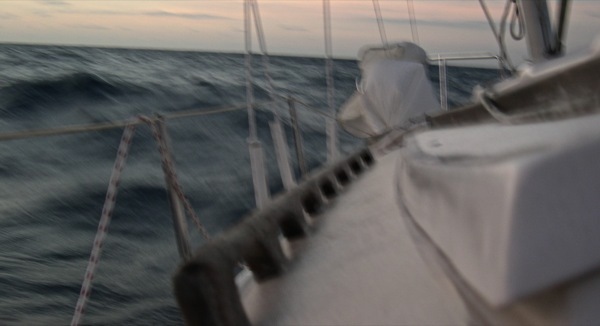 It was only my second night offshore — a grossly naive 20 year old captain of a 25′ sailboat 3 years older than I. The night before — my first night offshore ever — had been amazing. It began with a pod of dolphins and a few shrimp boats on the horizon & ended with the most amazing fireworks show in the sky. I laid on the deck staring into the heavens identifying constellations & watching shooting stars for hours. Tonight was different. I wasn’t yet comfortable enough with my boat to fully trust it under sail. More accurately, I wasn’t comfortable with my ability to handle her under sail. Not at night. Not with wind this strong. Tonight’s sunset was as beautiful as any I’ve ever seen, but when the stars disappeared and the wind picked up, I knew I was in for a long night. Soon the lightning appeared and the waves grew. By 1am my small outboard motor was struggling to keep the boat pointed in the right direction. Every time a wave lifted the back of the boat, the motor would lose contact with the water and scream the most mind jarring scream you’ve ever heard. It would float in the air for what seemed like minutes before another wave would pick up the front of the boat and the motor would again find traction below the surface. I learned to sail from a book I’d bought in college, and had only been able to practice on a few lakes near school. Never had I seen wind & waves like this. Or felt wind & waves like this, for the darkness of the night made it virtually impossible to see anything beyond the white fiberglass deck of my floating cell. When a storm pops up on a lake, you’re instructed to drop all of your sails & find shelter at a nearby dock. Seeing as how I was 60 miles from the nearest dock, all I knew to do was motor into the waves. The screaming outboard ultimately became so unbearable that I couldn’t stand it any longer. I decided to kill the motor and “lie ahull”. This was one of the storm tactics I remembered reading about, and as I recall, all it meant is that the boat drifts along with no sails or motor propelling it. I think I read about somebody surviving a hurricane one time by lying ahull. I figured if they could wait out hurricanes this way, surely I could take a nap & wait out this little storm until morning. With the boat thrashing side to side with each passing wave, it was a miracle in itself that I made it into my berth at the front of the boat without getting hit by one of the many flying objects in the cabin. I laid down for about 30 seconds before I heard a sound I hadn’t heard since days earlier standing on the beach. It was a huge wave, complete with white foam, headed right towards me. “Coast Guard, this uh…this is the Sailing Vessel Dawg Gone. Um…I…I was wondering if you could give me an idea of what the weather forecast looks like. I’m getting thrown around pretty good out here…” My voice cracked as I spoke, and their response was less than comforting. 1 to 2 foot waves? If these are 1-2′ waves, I must be going crazy! 5 knots of wind? There is no way this is only 5 or 10 knots of wind. Impossible! It was all I could do to finish the sentence and make it back to the cockpit before I threw up the tuna-cracker combo I had enjoyed a few hours before. I had been offshore, alone and completely out of sight of land, for almost 36 hours. And I was starting to have doubts. Why on Earth do I think I can do this? Alone? What makes me think I can sail? Am I going crazy? It sure sounds like I’m going crazy. Normal people don’t usually sit in the middle of the ocean yelling at waves that can’t yell back. Do they send helicopters to pick up crazy people? My heart was beating uncontrollably as I tried to swallow more crackers. Where do I go from here? Do I give up? How could I give up? How would I give up? This whole lying ahull this clearly isn’t working. What do I do? Then I knew. Like a revelation, I heard the words Mark, my sailing mentor, had told me so many times before. “Just remember. It’s a sailboat.” That was it. Just sail you idiot. So that’s what I did. I connected my life jacket to a safety line and carefully made my way to the bow. I raised the jib and trimmed the sheets. I was sailing. It was like a switch had been flipped. No longer was I consumed by the paralyzing fear I had moments before. No longer was I being thrown violently from side-to-side. No longer was I fighting against nature. The wind was still strong and the waves were still high, but now we — me, my boat & the water — were all working together in perfect harmony. Like I’d been given the keys to a God-created amusement ride, we were surfing down one wave after the next in joyous fashion. They say that it’s always darkest just before the dawn. I had just made it through one of the darkest nights of my young life. As the sun rose over the West coast of Florida that morning, the grin on my face could be seen from miles around. That’s when I knew. I’d become a sailor. 4 responses... read them below or add one. That was a marvellous post! Really had me smiling and giggling and the heart thumping.. You probably weren’t giggling though. Fantastic post, thanks for the read! I just… I just cannot imagine it. Of all the crazy things I’ve done, I cannot imagine being brave enough to do this.